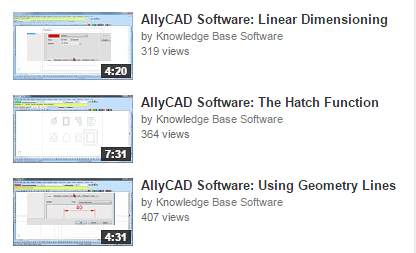 AllyCAD HOME comes with a User Guide, free Video Tutorials, Tech Tips and an extensive Help File feature. Download and get started on your design project straight away! The AllyCAD HOME version is ideal for the hobbyist or for small venture drawing purposes. It gives you all the CAD FUNCTIONALITY and all the CAD features of our Professional version. AllyCAD HOME is limited in its maximum drawing size (300kb) which is sufficient to complete medium scale designs. If more drawing size is required at a later stage, it is very easy to upgrade to our INNOVATE version (600kb). AllyCAD's intuitive interface has earned it the reputation as the most user-friendly & powerful CAD package available on the market. The software's industrial strength and specialized toolkits ensure that previously time consuming tasks take only seconds to complete. The plan layout feature means that there is no need to redraw the entire drawing when there are alterations to a design. " AllyCAD saves so much time - it can handle large volumes of data and images with ease. " I enjoy the advanced features it contains. It is also user friendly, which makes it great to work on.